4,280 Artworks have been viewed 4,280 times. 3 Artworks have been added to favourites 3 times. He entered in 1884 the Liceu de Artes e Ofícios do Rio de Janeiro, where studied under Victor Meireles. Parallel to his studies in the Liceu, he entered the Academia Imperial de Belas Artes (English: Brazilian Imperial Academy) studying under professors Henrique Bernardelli, Rodolfo Amoedo and Jose Maria de Medeiros. In 1888 he received a gold medal at the Academy. Like many of his contemporaries, including some of his teachers, he was involved in the plight to renew the Academy's teaching methods, deemed obsolete and was among the creators of the short-lived" Ateliê Livre", together professors João Zeferino of Costa, Rodolfo Amoedo, Henrique Bernardelli and Rodolpho Bernardelli. Thanks to a prize received in 1892 Visconti travelled to Paris, where he attended the École des Beaux Arts the following year. He also took classes at the Académie Julian and the École nationale supérieure des arts décoratifs, where he was a pupil of art nouveau master Eugène Grasset. He was accepted at the Salon de la Nationale des Beaux Arts and at the Salon of the Société of des Artistes Français. 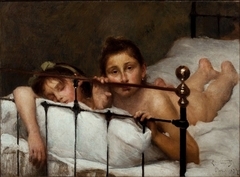 As one of the Brazilian representatives to the Exposition Universelle 1900 he exhibited the paintings Gioventú and Oréadas, for which he received a silver medal. Back in Brazil, Visconti exhibits in Rio de Janeiro and São Paulo, and obtains the first place in a contest for the drawing of postal stamps for the Brazilian Casa da Moeda. 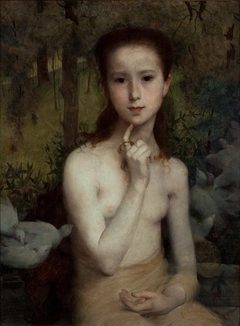 He returns once to Europe, where he exhibits at the Paris Salon of 1905 the portrait of the artist Nicolina Vaz de Assis now at the Museu Nacional de Belas Artes. In this same year, he is invited to paint the stage curtain for the Teatro Municipal of Rio de Janeiro which he completes in his studio in Paris. 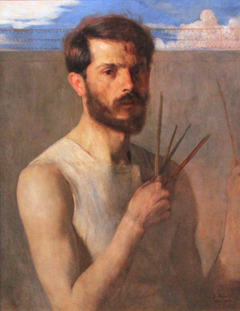 In June 1906, he is selected to replace Henrique Bernardelli as a professor of painting at the Escola Nacional de Belas Artes, the same Imperial Academia renamed after the proclamation of the republic. He accepted the position the following year after returning to Brazil, where he remained a teacher until 1913. Among his disciples were painters Marques Junior and Henrique Cavalleiro. Decorative schemes executed for the National Library or Biblioteca Nacional in (Rio de Janeiro) date from this period as does another gold medal he received at the International Exhibition of Saint-Louis (Louisiana Purchase Exposition), in 1904, for the painting "Recompensa de São Sebastião" (see external links). The museum of Santiago of the Chile acquired his "Sonho Místico" (Mystical Dream) in 1912. In 1913, Eliseu Visconti returned to Europe in order to paint large scale panels for the "foyer" of the Theatro Municipal do Rio de Janeiro. His plans to return are interrupted by the First World War so he stays in France until 1920. The resulting paintings for the "foyer" were sent to Brazil during the war, in 1915. In 1922 his triptych "Lar" awards him the Medal of Honor in a large exhibition created in Rio de Janeiro to commemorate the first centennial of Brazilian Independence, the Exposição do Centenário. The following year Visconti paints the mural decoration of Rio de Janeiro's municipal council hall. In 1924, he paints the panel depicting the signature of the first Republican Constitution, for the old federal court, also in Rio de Janeiro.